Margaret Duque Marble died on July 5, 2015 due to acute kidney failure. Born in Los Angeles in 1933, Margaret Mary Duque attended Marymount and Marlborough Schools before going to Georgetown Visitation in Washington D.C. In 1955, Margie married William Baird Marble, Jr., moved to Pasadena, and raised six children. A born leader, Margie led a variety of organizations there: President of the Junior League of Pasadena, President of the Town Club, and was a Dame of the Royal Institute. Margie always had a place in her heart for Santa Barbara and cherished her childhood memories of summers spent at Reina de Paz with her beloved horse Louie. In 1977, the Marble family moved to Montecito. After the death of her husband, Margie completed a degree in Psychology from the University of California, Santa Barbara. 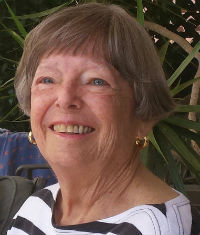 She continued her involvement with community organizations, including the Council on Alcoholism and Drug Abuse, The Catholic Education Foundation, the Scholarship Foundation of Santa Barbara, the Los Angeles Regional Food Bank, Children’s Hospital of Los Angeles, Santa Barbara Neighborhood Clinics, the Santa Barbara Chamber Orchestra, the Music Academy of the West, Lotusland, and the Santa Barbara Botanical Garden, among others. Margie loved traveling, gardening, playing bridge, and listening to Mozart. She shared an irreverent sense of humor with friends and family and did not suffer fools. She loved to sing, joining the choir at the Santa Barbara Mission and then later at the San Roque Church. Margie’s interest in genealogy drew her to research and write the histories of her ancestors as well as her husband’s. In 2013 she published “Seeing the Elephant,” a story of her great-grandfather James Stringer Fleming’s journey across America during the California Gold Rush. Margie is survived by her six children – Cecily, Baird, Tom, Amanda, Margaret, and John – their spouses, ten grandchildren, and three great-grandchildren, as well as several cousins, nieces, nephews, and two sisters-in-law. A memorial service for Margie will be held at 10:30 am on July 25, 2015 at the San Roque Church, 3200 Calle Cedro, Santa Barbara, CA 93105.